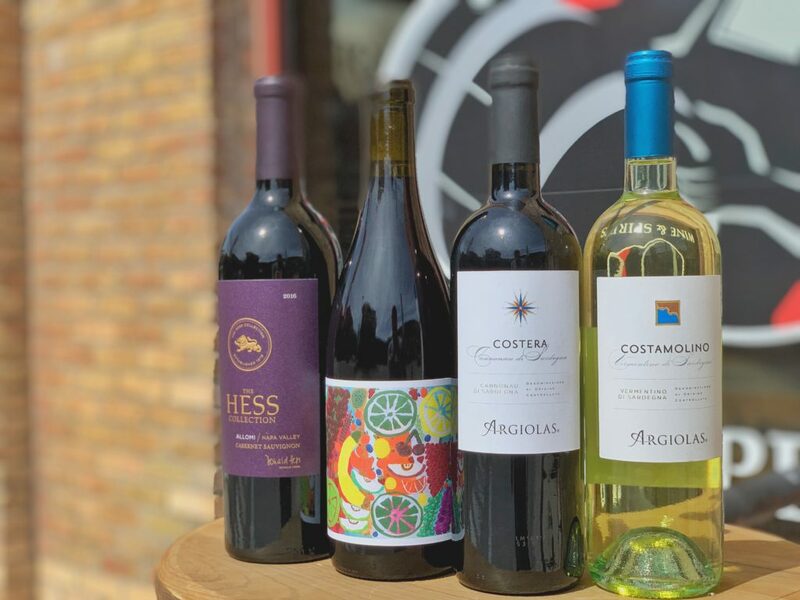 Spring in this weekend and enjoy these lovely wines! Argiolas Costamolino Vermentino di Sardegna – Argiolas is the foremost wine estate on the island of Sardinia producing archetypal wines from native varietals. The winery was founded in 1938 by Antonio Argiolas and was the first on the island to pursue quality over quantity. Today, the Argiolas family is recognized as Sardinia’s leading wine producer. Sardinia is the second-largest island in the Mediterranean and lies roughly 190 miles west of Italy’s mainland. The vineyards of Argiolas are located in Serdiana in the Trexenta hills just north of the capital of Cagliari. Argiolas farms 600 acres of native Sardinian grapes including Nuragus, Monica, and Cannonau. Costamolino, named after the area, is made from Vermentino, an aromatic white grape variety that thrives in the Mediterranean climate of Sardinia. The grapes are harvested in August and September and vinified in stainless-steel tanks to retain acidity. A small percentage sees malolactic fermentation to give the wine roundness and texture. Argiolas Costera Cannonau di Sardegna – Argiolas is the foremost wine estate on the island of Sardinia producing archetypal wines from native varietals. The winery was founded in 1938 by Antonio Argiolas and was the first on the island to pursue quality over quantity. Today, the Argiolas family is recognized as Sardinia’s leading producer of wine. Costera, a name referring to hills, is made from Cannonau (Garnacha or Grenache). It is the workhorse red grape of Sardinia where it is likely to have arrived centuries ago from Spain, although an alternative theory suggests that Cannonau originated in Sardinia. In either case, Cannonau is well-adapted to the warm Sardinian climate and gives a deeply-colored, full-bodied red wine. Costera shows the typicity of the Cannonau grape with flavors of very ripe strawberries, black cherries, herbs, and spices. The warmth and intense sunlight of southern Sardinia can be seen and felt in the wine with unexpectedly deep color and fullness on the palate. French oak barriques provide rounded tannins and flavors of vanilla. Jolie Laide Barsotti Vineyard Gamay – Jolie Laide is a one-man operation based in Sebastopol, CA, where winemaker Scott Schultz makes only 500 cases of wine a year under his own label. The name Jolie-Laide translates loosely to “Pretty-Ugly”, a French term of endearment to describe something that is unconventionally beautiful. Scott makes some of the most unique and highly sought-after wines in California that are true to their name. He works with Wind Gap, Ryme Cellars, Pax, and formerly, Arnot-Roberts. They all share, both a winemaking space, and similar philosophies in discovering unconventional beauty. This Gamay is grown at high elevation in the beautiful red grinitic soils of the Sierra Foothills. Picked in two separate passes, one early and one a bit later makes for a wine that is a bit riper and fleshed out than in years passed. The clusters are left whole and started by carbonic maceration, which lends its distinctive high tone appeal but eventually crushed by foot and finished whole cluster for skin contact and extraction. Pressed to neutral barrique for a short 6 month elevage and bottled young to preserve delicate aromatics. Light, fresh and utterly charming. Wild strawberry and summer herbs with cranberry tartness. Hess Collection Allomi Cab Sauv – Though just 30 miles long and a few miles wide, Napa Valley is home to diverse microclimates and soils uniquely suited to wine grape growing. It is considered one of the premier wine regions in the world and for our Napa Valley wines we look to our estate vineyards and select growers throughout the valley to source the very best wine grapes. The Hess Collection wines are family owned, sustainably farmed and dedicated to reflecting a true sense of place. Allomi is named in honor of the original Spanish land grant in Napa County which the native Patwin people lent their name – Rancho Locoallomia. The Allomi vineyard lies in the gently rolling hills of northeastern Napa Valley, where the combination of long, warm growing seasons with well-drained soils create the optimal ripening conditions for Cabernet Sauvignon. The 210-acre vineyard is sustainably farmed and grows 35 unique growing blocks with six different Cabernet clones. On the nose, this wine delivers intriguing vegetal aromas with hints of mushroom and forest floor. On the palate, Allomi Cabernet is known to deliver moderate, well-integrated tannins and a round, plush mouthfeel making it one of the most popular Napa offerings. A wonderful brightness of raspberry and red plum delight the mid-palate, and these flavors are supported by a subtle oak spice that adds to the personality of the wine.